As I began to gravitate away from traditional road running for the more off-road variety of runs in 2010-11, one thing I very quickly became aware of is that our neighbours across the pacific have a massive, embracing and exciting culture of trail running going on. And while we have fantastic races and runners here in Australia, the vibe that is coming out of New Zealand in respect to trail running and ultra running is just phenomenal and something I think we Aussies could definitely learn from. Embedded deep within the centre of this culture is Malcolm Law, a man whose accomplishments place him neatly beside our own Pat Farmer and the great Dean Karnazes of the US. Fundraising-wise, in fact, I believe he far transcends both these men. I came across Mal in 2012 when he was in the midst of running the great Coastal Path in the UK, and struggling. Battling the withdrawal, due to injury, of his running partner, extreme pain, injury, and fatigue of his own, but pushing on in a mad determination to raise money for mental health, I instantly felt a connection. Here was a man doing what I was doing, but on a bigger and better scale. This guy was worth following! 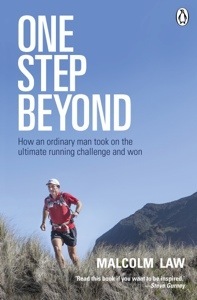 Fast forward to 2013 and the release of his first novel, One Step Beyond, I discovered a whole new side to Mal and a whole event that occurred in New Zealand that most Aussies probably would not have heard about. In 2009, Mal came to a crossroads in his life where he was left asking himself, what is it all really for? What am I doing? And what do I really want to be doing? One of the key things Mal needed to do was to come to grips with his brothers death from Leukaemia when they were children. He’d never properly grieved. He’d never made sense of such an early death and incredible family loss. As I did with Project Fuji, Mal started seeing running as a possible gateway to dealing with all of his pent up grief. He felt good when running, purposeful, and determined. He looked to doing something big, outlandish even, that he could use to raise money for the Leukemia foundation, and help remember his brother. And so began the 7in7, a fundraising and running effort that defies belief. One Step Beyond follows this story, as Mal goes about planning, preparing, and then carrying out his run of New Zealand’s 7 Great Mainland Walks in 7 days, many in excess of Marathon distance, and most taking anything up to 8hrs to complete. The hurdles Mal confronts not just in the running of these trails, but the logistics of getting from one to another as he traverses across both the Islands of New Zealand makes for riveting reading. As does his ingenious and inclusive approach to fundraising. I ploughed through this book like I sprint through a 10km (or used to!). I just couldn’t stop. Reading it just made me feel good! One of the key reasons this novel is such a feel-good experience is Mal’s ability to attract and enlist so many generous people to his cause, and their willingness to drop everything to help. It speaks volumes of the man, and in my opinion, volumes of the Kiwis. What a country of generous and embracing people! I’ve visited some years back and loved it. But I’ve never run there. After reading Mal’s book, however, I know I simply must. There’s just too many great trails waiting to be run to not to. And too many great people to run with! If you’d like to be inspired, entertained, and pushed to run further and fundraise more, this is the book for you. Or even if you’d simply like to read about some of NZ’s great scenic walks, it’s well worth checking out. And mark my words, this is only the beginning. Mal’s got even bigger and better plans already in the mix that just seem beyond us all, let alone just one man. You can purchase Mal’s book here.